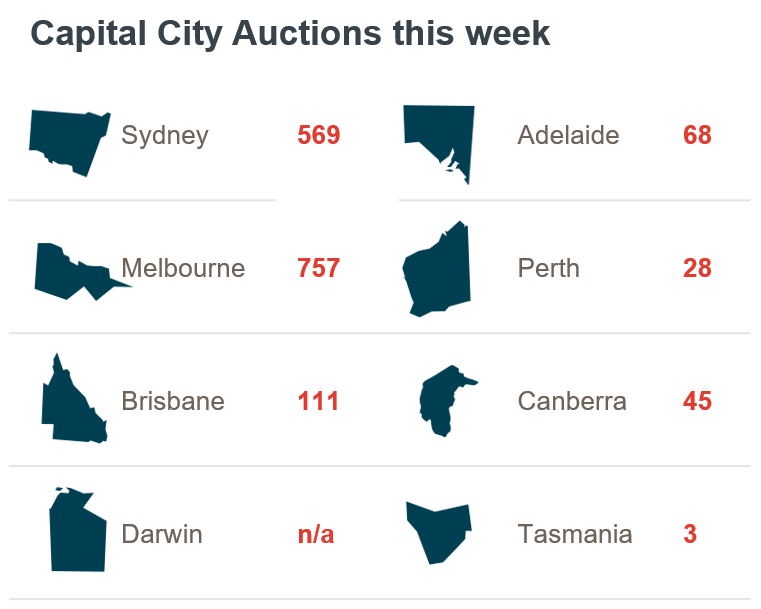 Auction activity across the combined capital cities is set to remain somewhat steady this week, with 1,581 properties scheduled to go to auction, decreasing slightly when compared to last week’s 1,627 auctions and higher than the 1,329 auctions held over the same week last year. In Melbourne, week-on-week activity will remain relatively unchanged, with 757 auctions scheduled across the city, up only slightly from the 756 held last week. While in Sydney, volumes will fall over the week, with 569 homes scheduled to go to auction, down from the 609 auctions last week. Activity across the remaining capital cities will be mixed this week, with volumes expected to increase in Adelaide and Canberra, while Brisbane, Perth and Tasmania will see fewer auctions held this week compared to last. Victoria has all the busiest suburbs for auctions this week, with 16 properties scheduled to go under the hammer in Craigieburn, followed closely by Glen Waverley (15), Werribee (13), and Epping and Mount Waverley both set to host 12 auctions each. Last week, the combined capital city final clearance rate rose slightly to 69.4 per cent, from 68.4 per cent the previous week. There were 1,627 auctions held last week, decreasing from the 1,766 the previous week. Over the corresponding week last year, auction volumes were lower, with 1,391 held and a higher rate of clearance (70.5 per cent). Across Melbourne, the final clearance rate increased to 74.9 per cent last week, from 72.9 per cent the previous week, remaining strong relative to Sydney, where clearance rates have been trending below 70 per cent for the last 6 weeks. The final auction clearance rate for the city increased week-on-week, with 69.2 per cent of auctions clearing, up slightly from the previous week’s 68.6 per cent. Volumes across both markets were lower week-on-week, with 756 auctions held across Melbourne last week, down from 818 the previous week, and 609 Sydney auctions held last week, falling from the 656 held the week prior. The remaining capital cities all saw an improvement in clearance rates last week, when compared the previous week. The Wollongong region was the best performing non-capital city region last week in terms of clearance rate, with 76.5 per cent of auctions successful. While Geelong had the highest number of auctions (42).